There are not too many people whose dream job it is to work long shifts, going out in hot summers and cold winters, to make sure people get the food they ordered as fast as possible. Nevertheless, there are a few million Chinese on the road every day, going through congested traffic and bad weather, to deliver customer orders on time. It should be enough to receive a simple ‘thank you,’ but Chinese netizens do not seem to agree on the subject. Recently, the topic of whether or not to thank the food delivery person for delivering an order became a trending topic on Chinese social media platform Weibo, where the hashtag “Do We Need to Thank the Delivery Man” (#该不该跟外卖员说谢谢#) generated over 430 million views and triggered nearly 110.0000 reactions. The “thank you debate” soon blew up on social media, with many commenters arguing that saying ‘thank you’ is just basic manners. But there were also many commenters who feel that personally thanking the deliverymen is unnecessary, arguing that customers pay for this service and that it is their duty to deliver the food (on time), not a favor they are doing you. “I am paying the deliveryman, so what do I have to thank him or her for? You don’t thank your boss every time you get your salary, do you?”, one Weibo user responded. Other commenters say it depends on the attitude and service of the delivery person; if the delivered soup has been spilled, or if they are very late in delivering, they feel they do not need to thank them. Being a delivery person is not an easy job. 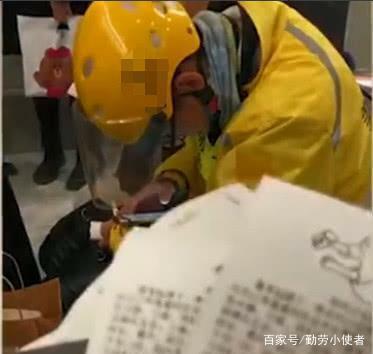 In the past couple of months, two stories of Chinese deliverymen struggling on the job went viral. In one case, a delivery man was filmed being in tears in a shopping mall after an order was canceled for which he had waited for an hour. In another story, a young delivery guy was caught crying in the pouring rain for over 20 minutes, until an old men came up to him and offered him an umbrella. The young man had allegedly discovered a package was stolen from his delivery cart. These stories usually lead to online discussions in which people urge others to treat deliverymen with more respect. In recent years, the Chinese food delivery market has seen staggering growth, with Meituan Waimai (美团外卖) and Ele.me (饿了么) being market leaders. In 2018, Meituan alone employed over 2.7 million food delivery staff, half a million more than the year before. After the discussion blew up on social media, the Meituan research report was further inspected by netizens. In the report, it says that the delivery staff’s wish that customers would say “thank you” actually comes in the 8th place of surveyed wishes, not in the third place.